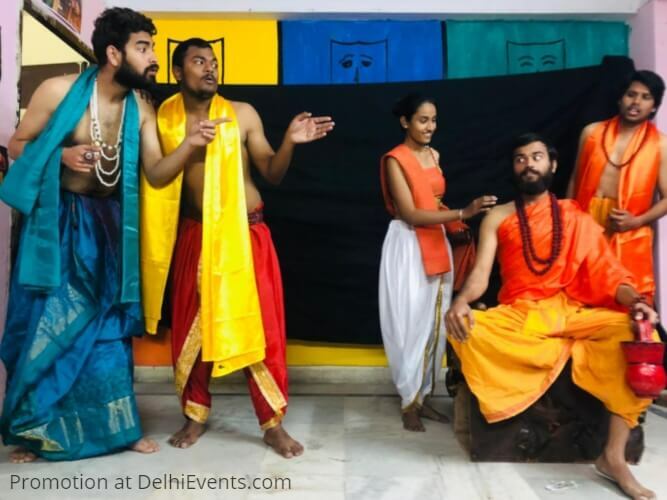 Event Description : THEATRE : Taabir Theatre Group presents "Hasya Chudamani" Hindi Comedy Play. Hasya Chudamani is a Prahasan (Satire),written by Sanskrit Playwright Vatsaraj and translated into Hindi by Nemichandra Jain. A biting satire on misgovernance, avarice, corrupt and hypocritical Sanyasis, Gurus and Charlatans who are unmindful of the suffering public and are blinded by lust, ambition and greed. A must watch 12th Century Sanskrit play that is uncannily relevant in our times. The story ends when Kalakarandak visits the ashram to save his guru Gyanrashi and proves his innocence. The play comprised of eight artists where actors bagged special appreciation for their flawless acts and beautiful expressions. The play narrates about the prevailing society in a comical manner. Performed by Anuj, Kuldeep, Simran Nirvan, Shivangi Tripathi, Gaurav Sharma, Rishab Sharma, Jatin Wadhwa, Simran Singh, Deepak Mahto, Shyam Kumar, Tshitij, Buland Singh.